Built from sturdy 24 gauge 18/8 stainless steel, this standard weight 1/9 size steam table pan features reinforced corners that add strength where the pan takes the most abuse. Ideal for use in hot and cold tables at your catering event or buffet, this impact-resistant pan makes cleaning and refilling a breeze. Easy to use and available at a great value, this anti-jam stainless steel pan is a dependable addition to any kitchen! We have these in many sizes and really enjoy using them. They work really well and keep the food warm. They look nice and clean too. Those containers are very useful in restaurant industry . We bought already some of them, and we will order soon more. Very good quality for the price we paid. The hotel pans are awesome. Very durable and easy to clean. Dishwasher safe obviously. Perfect for flipping products at the end of the night. We use at all stores. We have been buying these to replace our plastic ones. I wish we bought these first. Good quality and the metal conducts the cold so much better. This one ninth size is perfect for keeping salt on hand. I have ordered several different sizes and will continue to order more for home. Very nice deep pan with this product. Perfect for prepping flour, egg, and bread crumbs to have a chicken cutlet breading station in just seconds! Nice little pans for our kitchen team. They have no issue with choice products and our happy theybhave the tools to do the job. Keep the kitchen happy. Great pans. That are durable and worth the money. I have these in many sizes and they all stand up to heavy daily use. Great buy. This is the work horse of our commercial establishment. We use it for most of our ingredients, and find that it is the perfect size for medium volume business. These pans does exactly what they were bought to do. They helps to keep food at a safe temerature and well protected at all times. They are very good on quality and great in price. Not only was it shipped expediently, but it was packaged with care and brought to our door without any issues. I would recommend this product highly. Greatttt perfect for all my pizza toppings. It's made my kitchen more organised and made my workers more happy. Buy the lids to these as well, you won't find them cheaper anywhere else. This is another odd size that comes in very handy. We use some on the line for the less popular toppings. this way you can have more options without taking up a ton of room. We have a lot of toppings at our restaurant that needed smaller compartments for our sandwich table and these were perfect for the job. Works great and easy to clean and stack away. I have every size of hotel pan under the sun, and 9 (1/9th) pans are probably the most used. These are sturdy and well made. They can get banged up a little with regular use but overall they're super solid and a good price. We use these for ingredients such as onions and peppers, small in size but it's deep so it still holds plenty of product. High quality as well. Perfect for the steam table. Holds the perfect amount of vegetables, mashed potatoes and multiple other food items. Also great to store bar fruit in. This small 1/9 stainless steel pan is great because it can be used for a hot or cold food. It is very useful and durable. Our most popular pan ever! We are working with a lot of kind of ingredients so on our regular day we are using more that 25 at the same time! Quality is great, price is outstanding. I bought these unsure if it was what I needed or not. They're perfect. I have been able to adjust and readjust my prep table with these things and I think I have finally found the perfect solution. These pans really made a difference at my prep table. The only downside I've come across is that you can never have too many. I need more, always! A very versatile pan for holding small amount of prepped items. Can be used on hold or cold application and being metal it conducts the hot or cold very well. This size pan is what we use for basting marinade for our grilled chicken. Perfect size, and we have a basting brush that has a little hook on it. Great, sturdy 1/9 pans. These are a necessity in any kitchen. We have them in our refrigerated prep table to hold ingredients for our salads. They are the perfect size and fit together well. Definitely recommend this product and will continue to buy more. I am very happy with the price. I only purchased this to melt butter in my oven for batter and it's done that and more. Our kitchen loves this product. Its compact and leaves room on our prep tables to do more cooking and prepping! It holds just about everything we need it to, and keeps things cool and warm as needed! Makes prep and preparedness a breeze. These are stack-able and have held up to heavy-duty use in a steam table. At the price point its easy to enough to keep backups, and a few on the shelf for easy cleaning. These are nice and small and affordable. Good price and worth it if you an combine on shipping with these. They hold up for longer than we do. We use this to hold our lettuce and tomatoes, and has done well for what we need it for. It's a great insulator and easy to clean, has held up against rust well. These pans are perfect to keep odds and ends cool or hot in the bar or kitchen. They make the mise en place simple and tidy. Well-constructed and cleaning is a breeze. I should have bought more of these. These little guys are great for use in our sandwich cooler for all sorts of condiments and what nots. A gem for the kitchen. When our cooks got them, they felt like it was christmas. We use this size all the time. A lot more then the large ones. Its small but its deep. Its smooth finish makes for a fast and easy clean up. The anti jam is a must with this deep pan. Solid, durable, and super easy to clean because it is stainless steel. Perfect for a bar well that serves garnishes in their mixed alcoholic drinks. Very durable stainless steel 1/9 pan. Easy to clean. Perfect for storing bar condiments such as cherries, orange slices, and lemon slices. I highly recommend this product! THIS pan was exactly what i expected. The quality is very good. The nice edges make them a breeze to clean. I would order these again. These are your typical restaurant pans and are of great quality. We use the pans for food prep and food storage. We would keep items such as portioned cheese, mushrooms, onions and tomatoes. Purchased this item with an opening order for our new restaurant. Have been using it for about a month and am very pleased with the weight and quality of the product. Substantially less expensive than the "brand name" yet of enough thickness that it will be very durable. Nice to not have to separate jammed pans! Would purchase again. These are about as good as you can get. They are durable and priced right. We get all of our steam pans from this website! This item is used in our prep station in the kitchen. 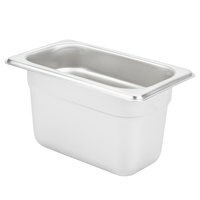 It holds a variety of foods and is easily cleaned. We have multiple ones and they fit perfectly in the prep area. Would recommend. Very nice pan. It is dishwasher safe, and easy to clean. The stainless steel finish keeps well after a lot of wear and tear, and rough handling. One of the best purchases I've made on here in a while. 12 pack of pans for this price is amazing. The pans are a medium duty steel, weigh almost nothing , and hold more than you expect. The 1/9 pan fits perfectly into the salad cooler and provides storage for so many items that make assembling salads or any other mult-ingredient dish easy and convenient. We use many of these same kind of pans, varying sizes in our kitchen. They are room savers when on the prep table and do a great job at keeping toppings fresh. I keep my salt and pepper in these pans.These are a great buy for the price and are a lot more solid than you would expect for a value brand. I would buy these again. We have several sizes of hotel pans for different uses. We use the 1/9 size in our prep table to store less frequently used items e.g. basil, parsley, cilantro. These are durable, clean well and last forever. Nothing too dramatic about 1/9th pans, but when you run out and need them quick, the choice is an easy one. Quick shipping and the price was great. This size comes in handy when you need some quantity of ingredients in a relatively small amount of space. They are very durable and will last a lifetime. Wish I would have gotten the Vollrath Super V version instead. These dented easily for our restaurant. I have order the Super V pans for everything else other than the 1/9 pans, and so far they have been bullet proof! Thank you for your review! Your account has been credited for the dented pans. These standard weight pans are a great value, but if you are looking for the Vollrath Super Pan V, the item number is 92230942. These pans fit perfectly with our Coldmaster cold pan organizer. They create a professional display. Pair these pans with a clear spoon slotted lid and they are perfect for catering any event. I wish I got the heavyweight ones. The standard ones don't have the same quality as the heavyweight alternative. For lite use these are fine. Good quality pan. We use these in our pizza make table to increase the amount of items we can keep on the top. The 4" depth is perfect. These pans are not the heaviest pans available, but they are very adequate weight. They wash up and hold up well. Excellent light duty use. They do dent easily. First shipment was damaged, but Webstaurant replaced them immediately with no hassle. For the price you really can't go wrong. These 1/9 size pans work great for keeping smaller pershable items. We used them for our sandwich bar. These pans are easy to clean and store. We use these pans in our cold pan on our buffet. They work perfectly and stay cold. They are durable and easy to clean too. This pan is great for hot holding or cold holding. It is very strong and the ends don't bend very easily which keeps them from sticking. I love these 4" deep stainless steel pans! We replaced most of our 1/6 sized pans and use these for items that aren't used that often...the less in the pan the less wasted! The bottom of pan is wide so it won't tip easily. It's an anti-jam system, so you don't have to worry about stacking up also.